Ellis Island, 1913. An image from DPLA's exhibition on emigrants leaving Europe for America. She has little black boots on that come up to her knickers, a white scarf wrapped around her petite face, dark bangs peeking out. A boy, maybe her brother, stands by protectively, wearing a cap and carrying a pack slung over his back. 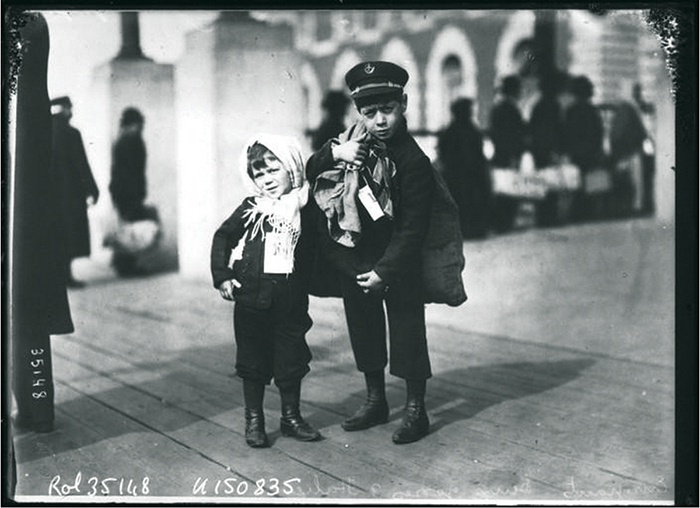 Two Italian kids, planting their feet in America for the first time on Ellis Island in 1913. What had they left behind? And what lay ahead for them? It’s this photo—and others like it—that got Maura Marx into a bit of trouble. Marx is director of the effort to launch the Digital Public Library of America (DPLA), and the photos are part of its first exhibitions about emigrants leaving Europe to come to America. That’s the spirit behind the project Marx is spearheading—an effort to digitize the nation’s little-known cultural archives and share them, completely free of charge, with the public. When DPLA launches April 18, it will already contain hundreds of collections from around the country, from daguerreotypes of African slaves to medieval manuscripts, from 19th-century newspapers from small-town Kentucky to newsreel footage from much of the past century. 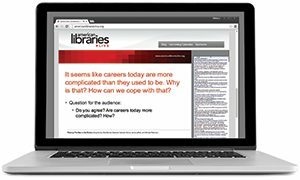 When DPLA launches, it will essentially be a portal to a fraction of what’s already out there on the web: an array of digitized special collections from all over the United States, from public to academic to special libraries and national collections, like the Smithsonian and the National Archives. What DPLA sets out to do is unite these materials at a single virtual place where people can access them. It’s an idea that has intrigued DPLA’s content director Emily Gore for a long time. Gore has a deep appreciation for primary source material: the diaries, photographs, historical records, and artifacts scattered throughout the country at various libraries and museums. When she worked for the State Library of North Carolina, Gore surveyed more than 1,000 cultural institutions, figuring out what special collections they housed and what kind of shape they were in. She drove around to hundreds of small towns, universities, and museums to look at their holdings. “I remember thinking, ‘Oh my gosh. I wish I had tons of money to give these people to digitize and share these materials broadly,’” Gore said. She browsed through the papers of US Senator Sam Ervin Jr. of North Carolina, the main investigator into the Watergate scandal, and saw his personal correspondence and keepsakes from that era, which are housed at Piedmont Community College in Morganton. She also found tapestries and pottery at the Museum of the Cherokee Indian that tell the story of North Carolina’s first inhabitants. The problem, Gore said, was that these things were spread out all over the state. And what’s more, you had to know they were there to look for them in the first place. Instead of being a repository, DPLA will be more of an aggregator of existing digital content and part of the movement to further digitize US special collections. DPLA will aggregate the metadata on all these collections and allow users to search and discover materials they previously didn’t have access to or possibly didn’t even know existed. The digital hubs project will also funnel money to smaller institutions that want to improve their digital collections. One of those resources is the Walter J. Brown Media Archives and Peabody Awards Collection at the University of Georgia Libraries, which contains thousands of hours of historical video footage, from the space race to newsreels on school integration, the civil rights movement, and even small-town films meant to showcase life in rural Georgia communities. “One of the great things about DPLA is that we get to expose people to the differences and the sameness of American life,” said Sheila McAlister, associate director of the Digital Library of Georgia. Gore explained that DPLA is all about what librarians are passionate about: compelling content. The technology is just a way to get to more of it more easily. Charles J. Henry has a rule of thumb: “If there’s a large number of really talented people who want something to work, odds are it will,” he said. It was the list of talented people on board that drew Henry, president of the Council on Library and Information Resources, a Washington, D.C.–based nonprofit, to join DPLA’s steering committee. The group first convened in 2010 and has since held meetings and presentations throughout the country to get the public involved. “There are and were so many good people, good institutions, academics, grant agencies, and thought leaders involved with this project that makes it unique,” said Henry. One of those talented folks is John Palfrey, DPLA board president and head of Phillips Academy in Andover, Massachusetts. Palfrey shared his vision for DPLA at a TED Talk at Andover in November 2012. In the age of ebooks, said Palfrey, it’s vital that someone look out for the public interest in keeping information free and accessible. But despite this big vision for what DPLA can be, it also has critics. Some worry the effort will replace local libraries already struggling in an era of budget cuts and austerity. Henry says DPLA isn’t meant to take away from local libraries but to complement them. In addition, said Henry, DPLA will provide professional development opportunities and access to technology that many local libraries want to use but struggle with. “Foundations have been generous with start-up funding because they see the value in kickstarting this project,” Marx said, “[but] there will be non-foundation support in the future.” She said this could include a mix of public-private funding from federal sources along with funding from participants using DPLA, such as libraries, museums, and archives. Another challenge, said digital library scholar Bob Schrier, is outreach. Schrier has written about how digital libraries need to harness social media as a way of building community around their collections, rather than just being a repository of information. But Schrier said DPLA has already done a lot of work in this area, organizing work sessions and idea exchanges around its development over the past two years. Although some have criticized DPLA as duplicating projects that are already out there—such as Google Books, the Internet Archive, and Project Gutenberg—Schrier doesn’t agree with that assessment. What remains to be seen, he said, is if the project fulfills a real need. 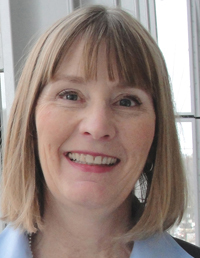 On April 18, library leaders—including ALA President Maureen Sullivan—will convene at the Boston Public Library to celebrate the initial launch of DPLA. The portal will include an interface with access to the collections that are already part of DPLA as well as an app store with applications designed to access and highlight parts of the collection. But even after the formal launch, the work won’t be over, said Marx, the director. 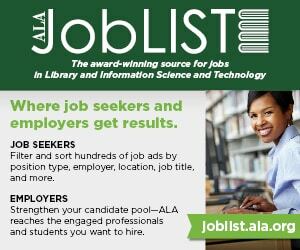 In the next few months, DPLA will conduct a search for an executive director and formally incorporate as a tax-exempt nonprofit, as well as continue to expand in both technology and content. Still, it’s a start, said Marx, and an effort that she hopes will lead to more and more collections being digitized and more free access for the American public to its rich cultural heritage. A world of information at your fingertips. That’s what Maura Marx imagines will be available when programmers create apps to help people access DPLA on their smartphones or tablets. The entire project has been based on an open-source-code principle. In November 2012, DPLA hosted its first “appfest hackathon” in Chattanooga, Tennessee, which invited people to develop web and mobile apps that use DPLA content. Several initial apps arose from that event, including one called “Follow That Cab!” which allows users to design a query and then get regular updates automatically. Another called “What Is Where?” geocodes DPLA sources and maps them, allowing users to see on a map what DPLA content is relevant to a geographic area. Kenny Whitebloom, project coordinator at Harvard’s Berkman Center for Internet and Society who works on the DPLA planning initiative, said these apps are in their infancy, and that DPLA plans to encourage their development via future hackathons and open calls to code. Marx envisions all kinds of apps being built from DPLA’s content, like a medical history app that pulls all of DPLA’s materials on the subject in a way users can work with—timelines, photo galleries, maps, and more. From the ALA perspective, the DPLA provides another valuable benefit. The very creation of the DPLA enterprise has raised the profile of libraries in the digital age. Some of the nation’s most prestigious institutions—Harvard University, National Endowment for the Humanities, National Archives, Alfred P. Sloan Foundation, John S. and James L. Knight Foundation, and the Institute of Museum and Library Services—have voted to agree that work on these “library” issues is a priority for the national policy agenda. ALA appreciates the ambitious and perhaps daunting scale and scope of the DPLA undertaking and looks forward to the spring 2013 unveiling of the initial installment.